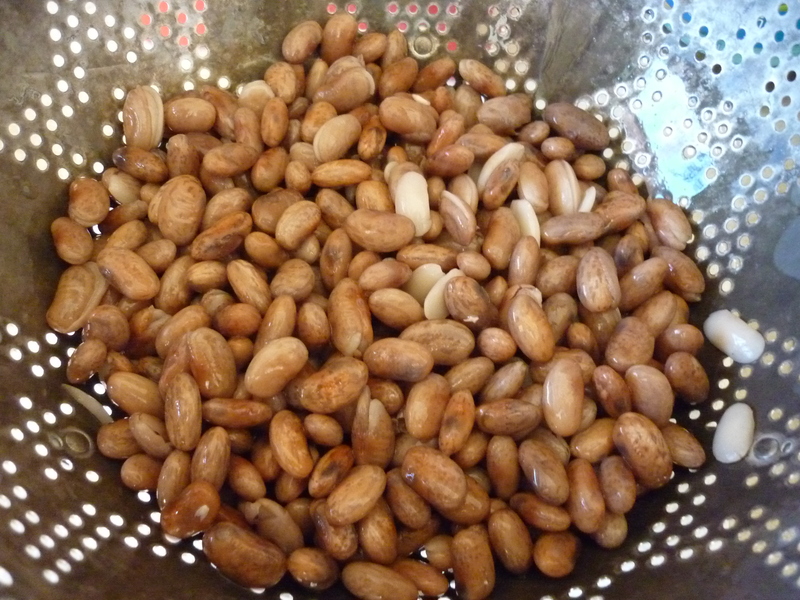 You are currently browsing the tag archive for the ‘pinto beans’ tag. This dinner is one that I make fairly frequently. I call it the cowboy dinner. My father spent the first quarter of his life in Texas. That stays with you and a little bit of it gets passed down. I love spicy, smoky, salty foods. The brisket recipe is from my aunt Joyce. It is so simple that you don’t really need a recipe. Simply know that if you put a beef brisket into a Reynolds oven bag and pour over a mixture of equal parts liquid smoke (1/2 bottle) with Worchestershire sauce and let it bake for 4 hours at 300 degrees, you will have a delicious piece of beef. 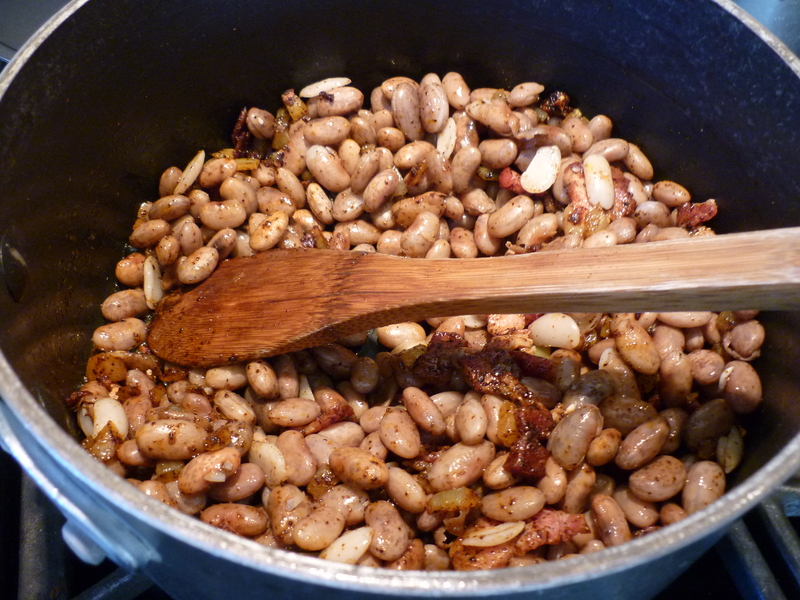 Aunt Joyce served it on New Year’s Day with black-eyed peas (which I cannot abide) and it has become a favorite of mine. She sliced it across the grain. Mine sometimes comes out more like shredded beef instead of sliced beef, but the taste is fabulous so who cares? 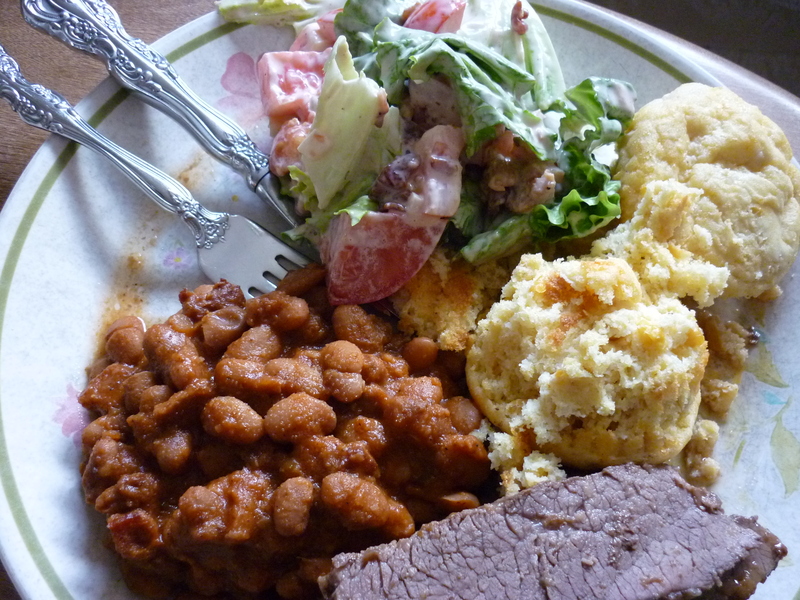 I serve my brisket with Ranch Beans, a recipe that originally came out of Sunset Magazine, I don’t know when. The original recipe says that it serves 6, but really I think it serves 12, so I only make a half recipe anymore. That is what I am going to tell you about. 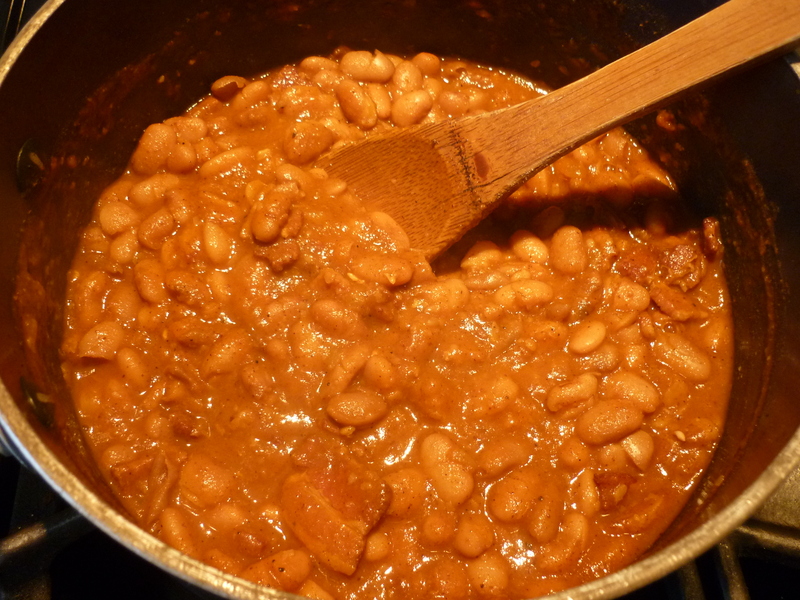 In a few days I look forward to heating up my leftover brisket and ranch beans, rolling them into a tortilla with grated cheese, jalapenos, and spiced sweet potatoes and chowing down. Amazing. Tonight I am serving the brisket and beans with corn bread muffins and BLT salad. 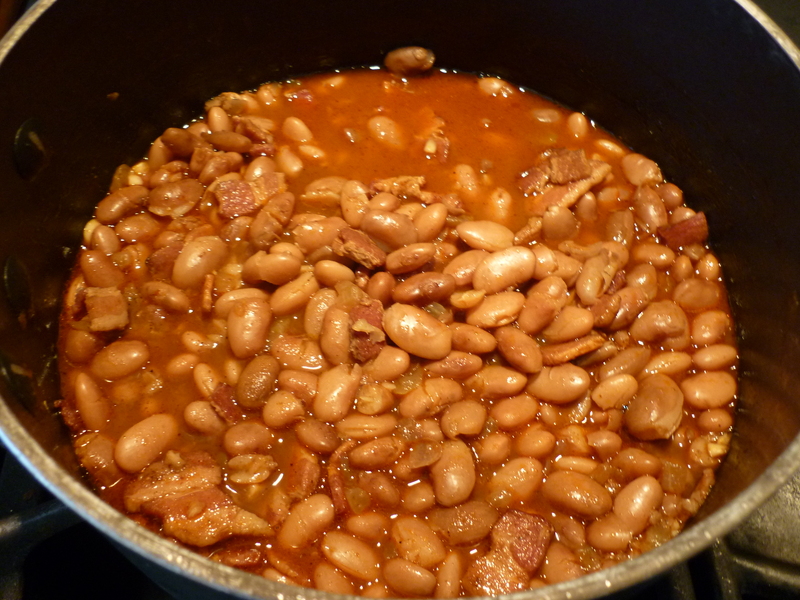 Put 1/2 # dried pinto beans into pan and cover with water to at least 2” above the beans. Bring to a boil and boil 3 minutes. 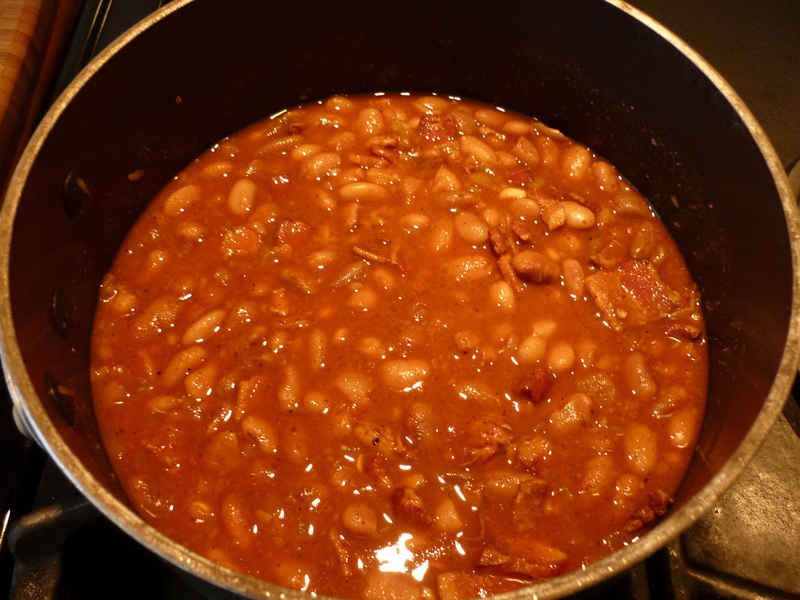 Remove from heat, cover, and let stand at least 1 or up to 4 hours; drain beans and pour into bowl. 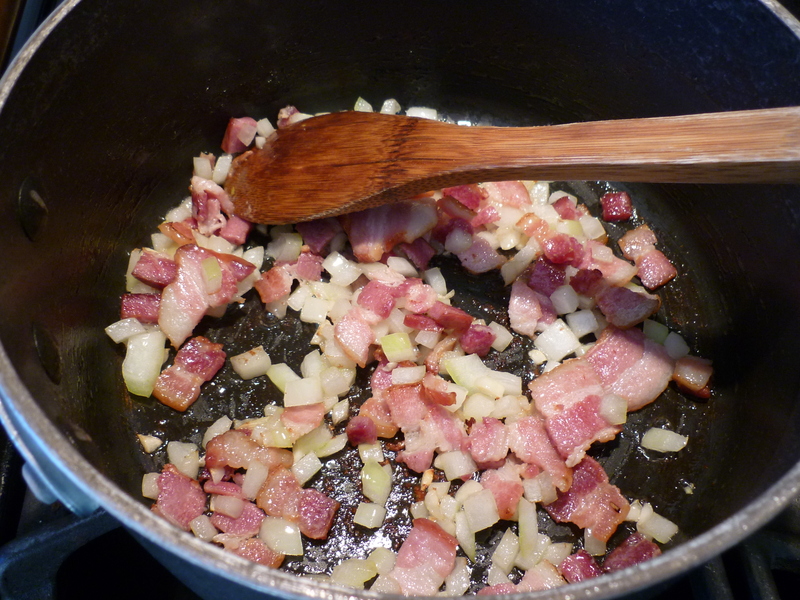 In the same pan, stir 1/8# (3-4 slices) chopped bacon over medium heat until lightly browned, about 5 minutes. Discard fat, if any. Add 1/2 small onion and 1 clove garlic; stir and cook until onion is limp, about 5 minutes. Stir in 1 Tbsp. chili powder. Add beans, 1-3/4 cups water, and pepper to taste. Cover and simmer until beans are tender to bite, about an hour. stir occasionally and reduce heat as mixture thickens. Add salt to taste.